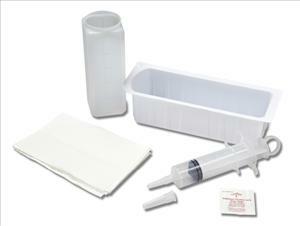 Contro-Piston Syringe Offers Uninterrupted Action in a Single-Hand Technique The sterile, disposable syringe with thumb ring is designed to minimize hand slippage and prevent contamination. The barrel features raised, large and easy-to-read graduations, which are calibrated in oz and cc. The tip, elongated to facilitate tube feeding, has an extra-large orifice for better removal of clots and mucous shreds. Includes: Rigid Tray, Alcohol Pad, Sq. Jar, Drape and Tyvek Lidding.